Just when we thought we would never see (or hear) another new offshore radio station again, along came the MV Communicator off the south-east coast of England with Laser 558. At first the station planned to have an antenna held vertical by a helium filled balloon and on 19/1/84 a giant 40 foot long balloon was launched to hold the antenna up. Due to insulation problems, the nylon securing rope melted and the balloon flew away. On 21/1/84 another balloon was successfully launched and the station put out test transmissions of Beatles records. The very next day this balloon flew away, and it wasn't until 1/4/84 that the station returned to the airwaves with a conventional aerial mast and test transmissions on 729 kHz, 411 metres, calling itself Laser 730. Regular programming began on 24/5/84 on 558 kHz with a continuous Top 40 format and mostly American DJs. The station was plagued by the most incredible variety of problems from financial to antenna, generators, complaints from other stations, mis-management, and was always surrounded by controversy, sometimes self-inflicted. All sorts of technical problems were suffered causing spells off-air but the station always managed to put out an exceptionally professional and entertaining sound - a tribute to the sheer dedication and skill of everyone involved on board. After weeks of being under surveillance by a British Government-chartered ship, the Dioptric Surveyor which remained on station to monitor supplies to the Communicator, a severe storm on the night of 4/5 November 1985 caused the station to close down at 8:30, and the ship sailed into Harwich. 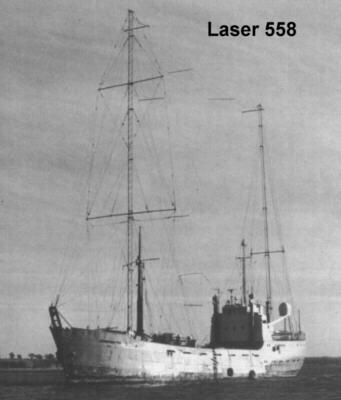 Incredibly, on 16/11/86 the MV Comminicator dropped anchor in the Knock Deep, 15 miles east of Felixtowe, and began broadcasting on 1/12/86 as Laser Hot Hits on 576 kHz. The station was once more putting out an amazing sound, albeit intermittently due to a continually collapsing antenna mast, until it was forced to close down for good on 20/4/87 due to lack of diesel fuel. Radio Sunk was a fictitious name given to the station for a period of tests around October 1987 when the ship was still at sea in the Sunk Anchorage. A lot of work had been done on the transmitter and, following a severe storm, it was tested on 576 kHz into a dummy load, but could in fact be received "on air". The museum has many recordings of Laser 558, Laser Hot Hits and even one of Radio Sunk.